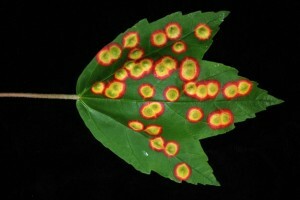 The crew of the Plant Diagnostic Laboratory are always on the hunt for new and exciting examples of plant damage. 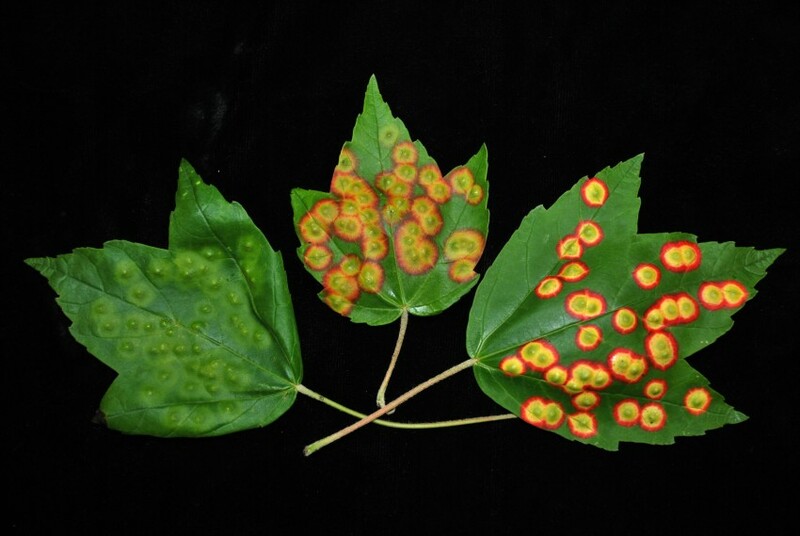 Last week, out walking her dog, Sabrina Tirpak our Principle Technician and photographer happened upon a red maple with these amazing red leaf spots. 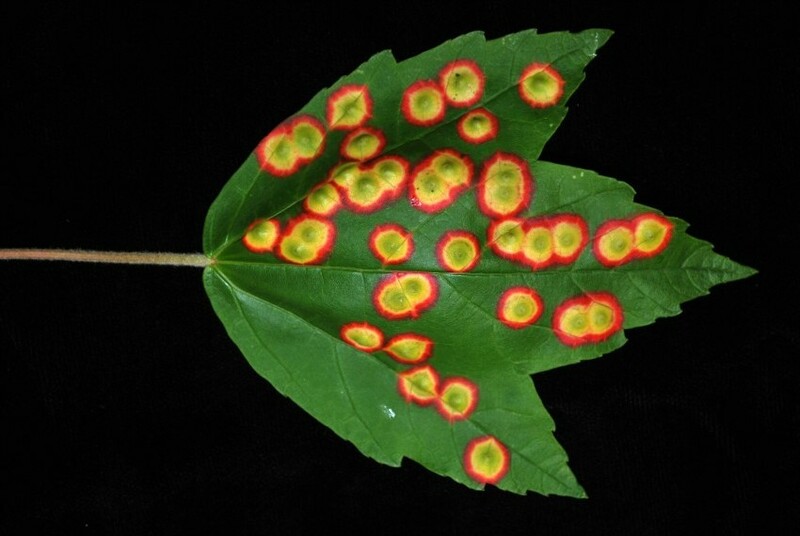 Ocellate gall midges, also commonly called maple eyespot gall midges, overwinter as pupae in the soil beneath their maple tree hosts. In the spring, they escape the soil and mate. Female midges subsequently fly to the canopy of a maple tree and deposit eggs in the soft tissue on the undersides of the young leaves. 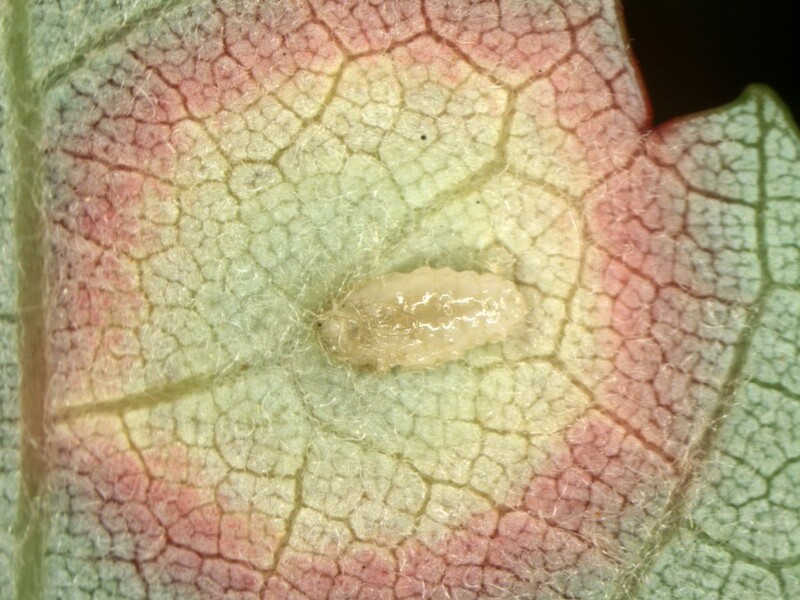 When the eggs hatch, each larva (maggot) attaches itself to the leaf with its mouthparts and begins to feed. Ocellate gall midge larvae secrete plant hormone-like chemicals that cause leaves to develop slight swellings (galls) directly above their feeding sites. Concentric rings of yellow (carotenoids) and red (anthocyanins) pigments surround the gall and make for a most amazing sight! Eventually, each larva drops to the ground and spends the remainder of the year as a pupa in the soil, waiting for next spring when it can complete its metamorphosis and emerge as a small fly.